Personal Capital helps visualize your finances and investments like no other money management app. If you're looking for free personal finance software on Mac that genuinely makes life easy, you have nothing to lose by giving it a try. Personal Capital is a highly effective personal finance software and investment tracking tool for managing money on your Mac. Even better, it’s completely free to use. Here we take a closer look at how this powerful financial management software works. If you’re one of the many Mac users that has been turned off by the new subscription model in Quicken 2018 for Mac, we think Personal Capital is the best alternative to Quicken for Mac out there. The reason we like Personal Capital so much is that not only does it help you get a hold on both daily finances and investments but it’s actually free to use. How can a serious personal finance software be completely free? Well Personal Capital isn’t just a budgeting app. It’s aimed primarily at those with investments or pensions and offers some surprisingly good – but optional – wealth optimization tools. These “robo-advisor” tools both identify areas where you may be being ripped-off in fees and make recommendations how to re-balance your portfolio for better yields. If you’re a DIY investor, you can simply take the results and recommendations that Personal Capital gives you and manage your investments yourself for free. However, if you have a significant funds to invest, it also gives you the option of using one of Personal Capital’s Financial Advisors for more personalized investment advice. This is where Personal Capital makes its money but you only get charged a commission on the value of your investment portfolio if you choose this option. The good thing is that Personal Capital Financial Advisors are fiduciaries which means that they are legally bound to act in your interests and not the financial instruments or funds they are recommending. If you do choose to contract a Financial Advisor, you need a minimum of $100,000 in assets. Fees for using a Personal Capital Financial Advisor range between 0.69%-0.89% of your overall portfolio profits although this is on a sliding scale to the more you invest. Obviously, Personal Capital does encourage you to use one of its Financial Advisors but there’s no hard sell if you don’t want to. This “freemium” style formula has proved incredibly successful and Personal Capital estimates it now has around 1.6 million customers managing over $300 billion in assets. Since it’s Cloud based there’s nothing to install and yet the interface of Personal Capital feels like something designed for macOS. Right from that start, the Personal Capital dashboard impresses thanks to a slick user interface, ease of use and ability to quickly get an overview of your finances. If you’ve ever used Mint.com, then you’ll already have some idea of how Personal Capital approaches budgeting compared to Quicken. However, Personal Capital has considerably more powerful investment optimization options than Mint. We’ll now look at these tools in more detail. 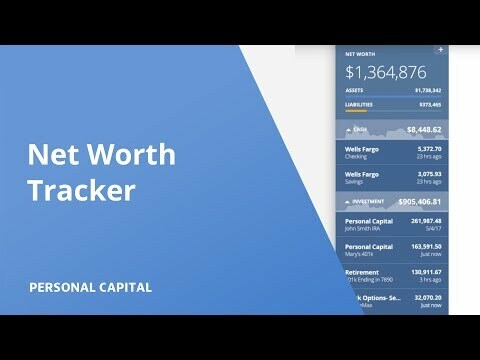 Everything in Personal Capital starts with the Dashboard which does a very good job of displaying your net worth. Personal Capital is a type of financial accounts aggregator and you can automatically import all of your accounts including everything from IRA accounts to mortgages and loans by connecting with your investment institution or bank. This is something that Personal Capital does particularly smoothly with far fewer sync problems compared to Quicken for Mac with around 14,000 institutions supported. The information is presented very clearly and helps make some surprising discoveries about how much your net worth is and where your major liabilities or debts are. Some of things we like most are the ability to create and follow budgets, clearly see your cash flow and see detailed income spending by category. You can even link your spending targets to an Apple Watch app which will alert you when you’re about to go over your limits. One of the biggest advantages that Personal Capital has over traditional budgeting tools like Quicken is its investment analysis and optimization features. Personal Capital does this via a general investment health checkup and by analyzing fees and charges on your investments. The Investment Analyzer is probably one of the key features behind the success of Personal Capital as it’s a very quick, effective, powerful and free way to maximize your investments. The two main tools to achieve this are the Fee Analyzer and Investment Checkup Tool which we’ll look at more closely. One thing that Personal Capital can help you identify right away is where fund brokers are charging hidden management fees. If you’ve got several funds, these fees can add up surprisingly quickly and are often hard to identify as they use names such as custodial fees, inactivity fees or 12b-1 fees. These can actually run into thousands if not hundreds of thousands of dollars for very large investments. Personal Capital uses a nifty Fee Analyzer to identify these fees and graphically displays how much you’re losing in mutual funds, investment accounts, 401k retirement funds etc. This is particularly useful when analyzing pensions as it also projects what impact it will have on your final retirement fund depending when you plan to retire. This is one of the quickest and easiest ways to identify where your investments are losing money but you can also do a more general analysis of how your investments are performing. The Investment Checkup tool analyzes your current holdings and suggest where you can make improvements. One of the smartest components if this feature is the Risk Analysis tool which where possible, identifies investments where you can lower the risk but still get the same level of return. We also like the Allocation Comparison tab which helps to identify areas where you should re-balance your assets to capture the greatest possible returns. This provides a Current and Target Allocation which Personal Capital recommends you aim for. Quite often, this will recommend significantly reducing your cash holdings and putting them into stocks. Overall, the Investment Analyzer is one of the best features of Personal Capital and genuinely helps you maximize your investments. Most recently, the app also allows you to align your investments with your own ethical, environmental and social concerns for a more responsible portfolio. The planning tools in Personal Capital are naturally based around retirement plans. The Retirement Planner shows you exactly how much you can expect to get in your pension based on your retirement age. You can adjust the tool to select your desired income on retirement and the retirement planning tool will suggest what you need to do to your pension portfolio or 401k in order to reach that point. We like the fact that the tool is dynamic so you can add events to it such as planning for college, getting married or other assets such as rental income, inheritances and other windfalls to see how they will directly affect your retirement income. Quite often personal finance mobile apps are a letdown either offering limited features or simply not working well. The Personal Capital mobile app for iPad and iPhone offers pretty much all of the information you can see in the desktop version. As mentioned earlier, there’s even an Apple Watch app to send alerts regarding account movements and to help keep you on track with your budget. Can I Trust Personal Capital? Probably the biggest concern of using online financial applications like Personal Capital is how safe is it to trust them with your financial log on details? Personal Capital is regulated by the Securities and Exchange Commission (SEC) so is subject to all the same security controls as any other finance house. It also employs a range of security measures such as AES-256 Encryption, SSL Encryption, device registration and no one at Personal Capital is actually allowed to access your data anyway. More importantly, your financial credentials are never saved by Personal Capital. Instead it uses the highly secure Yodlee which is an encrypted platform used by many major financial applications to store and deliver customer financial data. This adds an extra level of protection compared to Quicken which stores your banking log-on credentials on its own servers. No one can ever say that a banking system is 100% bullet proof but the measures Personal Capital take are above and beyond those of most. What Are The Downsides To Personal Capital? No budgeting software is perfect and there are some drawbacks to Personal Capital too. One is that you can’t quite perform the same amount of micro analysis on spending like you can on Quicken. If you like to really drill down deep into transactions, it might not be for you. Personal Capital is certainly more skewed towards investment management than budgeting illustrated by the fact that you can’t change transaction dates. This means that if you have a fixed payment such as a salary or pension that’s credited on the 1st of every month and it falls on a weekend or holiday, the transaction will appear in Personal Capital as the last banking day before that. As a result, Personal Capital will show that you have a double payment in the same month which messes up your budget. There’s also no denying that the investment features are aimed more at those with significant investment holdings although the budgeting tools are useful for rich and poor alike. If you do have significant investment holdings, it’s well worth at least trying the Personal Capital advisor service especially since they’re fiduciaries. They will be able to optimize your investments especially when it comes to tax filing or harvesting and creating a custom investment plan based on your circumstances. For those that have given up on Quicken for Mac or want a better personal finance application that genuinely increases your wealth, we strongly recommend giving Personal Capital a go. You can start using Personal Capital for free so you don’t have much to lose anyway. I’ve been using Personal Capital for about 8 months and the syncing issues are horrible. Yes, it syncs easily most of the time, but then later I find: duplicate transactions, missing transactions, transactions on the wrong account. When I report it to system support, they either fix the issue quickly, or say they are working on it and I never hear from them again. I have wasted a lot of time trying to sort out and correct the inaccuracies. Thanks for sharing your experiences. Unfortunately, there aren’t any personal finance apps that sync perfectly with banks – on Mac or Windows – but the reason is usually down to the specific banking institution you’re connecting to. Some support syncing from third party apps much better than others but most are constantly making changes to third-party access for security reasons and this leads to errors in the app. The syncing in Personal Capital is actually better than most but it’s not perfect unfortunately but they usually get things fixed quickly depending on the institution and complexity of the problem.